Students at the event received Associated Bank piggy banks and participated in a number of financial education activities with the help of Associated Bank volunteers. The sights and sounds of a hockey game can be overwhelming for children on the autism spectrum. That is why Associated Bank recently teamed up with the Autism Society of Minnesota (AuSM) and the Minnesota Wild to bring 70 kids to visit Xcel Energy Center on Thursday, March 14. 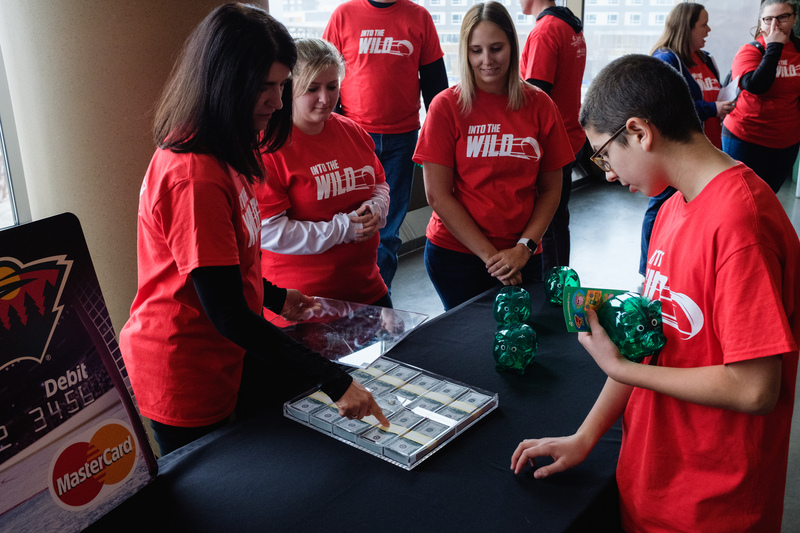 The “Into the Wild” event was created to let students with autism experience the excitement of cheering on a local sports team without the overwhelming feel of 18,000 fans in a packed arena. A low-stakes practice run is the perfect way to help students gauge readiness to attend a real game in a fun and supportive environment. When the students from Lionsgate Academy and The Academy of Whole Learning arrived at Xcel Energy Center the morning of the event, they picked up their “tickets” at the box office and navigated through the security line. They were then escorted to the private suites to watch the Wild’s open skate. From there, students took a tour of the arena and participated in a variety of other activities. Associated Bank and AuSM designed activities for the event participants to provide a range of educational experiences. With the help of volunteers, students wrote encouragement letters to Wild players, discussed how they feel supported by their community, and learned about financial responsibility through activities like check writing and deciding needs versus wants. The students also got to participate in the Associated Bank Wild Hockey Shots Interactive Photo Experience as they took pictures with a Wild player via the virtual reality program. Associated Bank established their partnership with AuSM in 2018, a natural fit for the bank and its colleague resource group Associated Forward Abilities Network (AFAN). AFAN is focused on supporting individuals with disabilities and those who provide support to individuals with disabilities. “I think one of the nicest things we heard from students was, ‘I expected it to be so much louder. I’m not as scared to maybe go to an arena as I was before,’” said Sarah Hauer, a Lionsgate Academy teacher.